At Down to Earth Stroud we are all about gardens. We love growing food but we also undertake ornamental gardening and can handle most any green space, large or small. We are based in Stroud but undertake work across Gloucestershire as well. All our work is undertaken with the consideration of the immediate and the wider environment in mind and we aim to choose our methods according to that as much as possible. See our Private Gardening page for more on what we can do for you. 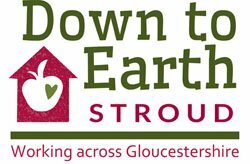 Down to Earth Stroud also work for Stroud District Council and Stroud Town Council, managing the gardens of the three councils’ vulnerable social housing residents. Contact us now to find out how we can help you get to grips with your garden or tame your veg patch – and how to grow more of your own food! Work with us: We are also always on the lookout for capable gardeners to join us, preferably with experience in using petrol tools. If you are interested, get in touch!